It’s a Toy Story… or is it? No major retailer could make up for the Toys “R” Us experience this Black Friday. With Toys “R” Us wrapping operations earlier this year, the race to fill the void and become the category market leader this holiday season was wide open. Walmart, Target, Kohl’s, Party City, Best Buy, Kroeger, and Amazon have put their hat in the ring to capture the $10Bn opportunity. All the players strengthened their offerings for the Black Friday weekend by bringing out ‘Toy catalogs’ as early as October to woo “parents and children”. While Walmart rolled out a virtual “toy lab” playground allowing kids to play with the company’s top toys, Kohl’s, partnered with Lego and FAO Schwarz to sell their products at its stores. Party City went the extra mile to open 50 “Toy City” pop-up stores. So who won round one of this battle? We looked at data in the Near platform to understand locations where Toy “R” Us had stores before and looked at walk-in data at stores within a 3-mile radius. This data was compared for the week of Thanksgiving and for 30 days prior. 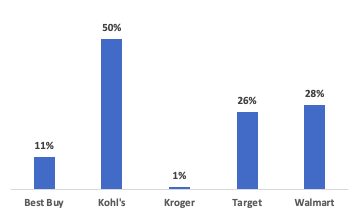 On comparing unique footfall data for parents at a store level, Kohl’s saw the highest growth with a 50% increase in unique walk-ins. Walmart though was the winner when it came to comparing the increase in share of walk-ins from parents across stores. 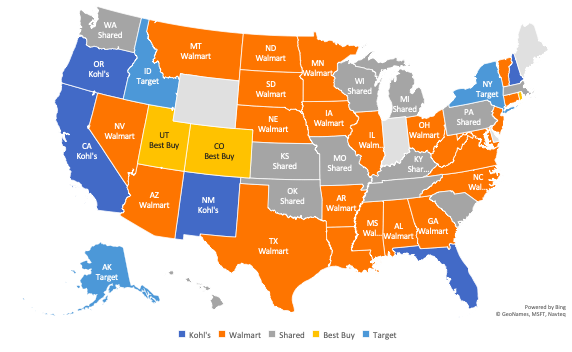 Data across the country shows a clear indicator of how each store fared in each state. 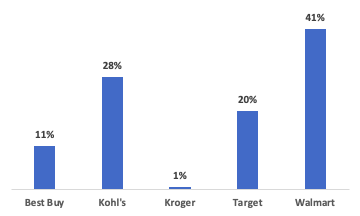 While Kohl’s was predominant over the west coast, parents in central and eastern America still preferred Walmart. We compared the Black Friday offers across these stores to understand the reason for these trends. While most of the offers were similar, the ones that stood out were the BOGO offers at Target and Kohl’s. What also set Kohl’s apart from the rest was a “$15 Kohl’s cash on every $50 spent” offer. This offer over and above the regular discount proved to be a major attraction — pulling parents to its stores. With no real USP in the toys and games section for any of these stores, it was probably more of a “shop for maximum overall gains” scenario for parents, rather than for the best collection/experience. In summary, Toys “R” US was a unique experience for children of all ages. All its stores were designed and operated to attract and retain that particular audience group. In its absence, if any of the major retailers want to grab a major share of this market, they will need an exclusive offering and possibly a separate brand altogether to cater to this segment. Initial gains might be slow, but long term brand equity will be in favor of such a player.